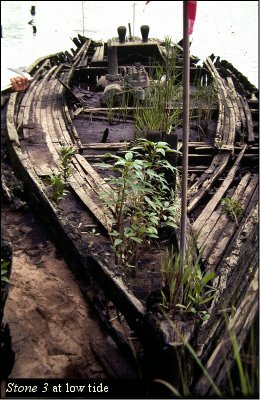 In June and July of 1983 the Underwater Archaeology Unit of the North Carolina Division of Archives and History spent two weeks documenting wrecked and abandoned vessels in the Cape Fear River adjacent to Wilmington, North Carolina. Although this section of the river is within the boundaries of the existing Wilmington National Register Historic District, no previous attempt had been made to inventory these vessel remains or other archaeological sites along the shoreline or beneath the water. During the nineteenth century Eagles Island was the scene of a great deal of industrial activity, including turpentine distilleries, naval stores warehouses, and shipyards. Today, with the exception of the USS North Carolina Battleship Memorial, there are no commercial enterprises or residences between the Cape Fear River Memorial Bridge and Point Peter. However, there is abundant physical evidence of the past activity. The remains of bulkheads and wharves can be seen along the water's edge, as well as the remains of a large number of shipwrecks. Thirty-seven sites were located in 1983, ranging from paddle wheel steamboats, tugboats, launches, skiffs, ferries, miscellaneous vessels, to barges. This report, which adds this rich collection of watercraft to the Wilmington National Register District, provides a brief description of each type of vessel and when possible an identity and information of its place in the context of maritime commerce. 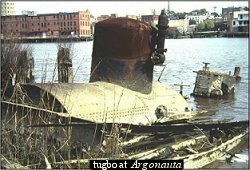 Click here to read Full Report: Underwater Archaeological Sites in the Wilmington Historic Shipwreck District.